List Price 2.00лв. VAT Incl. 1.90лв. VAT Incl. 1.80лв. VAT Incl. Car speaker connector, Chevrolet, Ford, Kia, Daihatsu, Mazda, Suzuki, Subaru Car speaker connector, Chevrolet, Ford, Kia, Daihatsu, Mazda, Suzuki, Subaru. 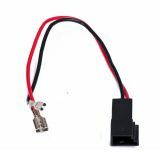 Car speaker connector Car speaker connector for the following car brands: Audi, Renault, Opel, Rover, Seat, VW, Fiat Punto 05. Car speaker connector, Seat Leon - Toledo, VW Golf IV-Passat '97>, Polo-Lupo Auto speaker jack SP6. Suitable for Seat Leon - Toledo, VW Golf IV-Passat '97>, Polo-Lupo. List Price 3.00лв. VAT Incl. 2.85лв. VAT Incl. 2.70лв. VAT Incl.